Can CoverSupermarket give me any help if I have any employment or legal problems? Our Legal Expenses policies written in conjunction with Lexelle and UK Underwriting Services on behalf of AXA Insurance UK plc gives access to free legal helplines. Simply telephone QDOS on 01455 850000 and QUOTE LEXELLE. If you opt to take out the legal expenses insurance as well, then this will cover you and your business in connection with a range of legal matters including employment and contractual disputes. Also, from as little as £42 per annum (Inc IPT) you can subscribe to CoverSupermarkets Business Legal Protection Service - a special service designed to give you expert advice on areas such as health & safety prosecutions, tax enquiries & disputes, employment disputes & awards, criminal proseccutions, jusry service and property protection - subject to availability and terms & conditions. Premium will vary dependant on business requirements. Can you cover my trade? At CoverSupermarket.com we cover a wide range of businesses. It is not possible to list all the businesses we cover. To confirm that we can cover your business call us on 0800 43 34 247. We recommend the use of a contractor who is a member of the National Advisory Council on Security Systems (NACOSS). In some cases, a NACOSS alarm will be a requirement. CoverSupermarket has minimum standards of security, which are explained within each policy taken up. Yes in most cases a claims form is required. Yes - if you make any changes to your business which may affect your insurance, let us know. If in doubt, give us a call. If you pay by instalments, this will usually be spread over the remaining payments. Alternatively, you can pay by cheque, credit or debit card*. *Except Solo, Electron or American Express. You can contact our 24 hour claims helplines in the policy booklets or please contact us during office hours 0800 43 34 247 – 9am –5.30pm. CoverSupermarket offers a range of payment options:Payment plan over 6 or 10 months*; Credit or debit cards**;Cheque. **Except Solo, Electron or American Express. We will despatch your renewal documents approximately three weeks before the due date. If you pay by Direct Debit your policy will be renewed automatically unless you tell us otherwise. CoverSupermarkets quotes are valid for 30 days. This enables us to ensure that are insurance rates a checked monthly to ensure constant competitiveness. If you call us for a quotation, we can usually give you a price in about 10-15 minutes. Just call Freephone 0800 43 34 247 Alternatively, you can use our online quotation facility to provide you with competitive terms. How soon can you cover any additional property? Immediately in most circumstances, just call freephone 0800 43 34 247. We can provide immediate cover, either over the telephone or via our online quotation facility cover can be confirmed immediately & direct to your selected e-mail address. Not normally more than three weeks before your renewal is due. Your policy documents will be sent out as soon as you have taken out your cover and you will normally receive them within 3-5 working days. If I need to make a claim, will someone come out and inspect the damage? That depends on the nature and complexity of the claim. If we do send someone to see the damage, for a property claim we use the services of our dedicated panel of loss adjusters, ensuring that the claim is dealt with promptly and efficiently. Yes, Our site uses secure socket layer encryption that encryts your payment details and prevents them from being accessed by third parties. What if my property is in an area that is prone to flooding? If your property is situated in a known flood area we will require further details from you to enable us to contact insurers for their consideration. However we do aim to provide competitive insurance quotations throughout the country. Employers liability is a legal liability to pay damages consequent upon bodily injury, illness or disease sustained by any employee in the course of their employment. Your policy excess is the amount you must pay in the event of a claim. This amount varies by insurer and your individual cirumstances. Please check your schedule and/or cerficate for details. Property owner's liability covers legal liability or damages and costs in respect of accidental injury to person(s), accidental damage to property or accidental nuisance occuring in connection with the property insured. What limit of indemnity do I need for my Employers Liability insurance? The minimum amount required by law is £5,000,000 however our policies will cover you for up to £10,000,000 for your peace of mind. What limit of indemnity do I need for my Public Liability insurance? The Public Liability indemnity limit usually varies between £1,000,000, £2,000,000 or £5,000,000 but may be required as high as £10,000,000. If you are in any doubt as to what limit of indemnity you require please feel free to Contact Us. All our policies provide standard "core covers" however additional sums insured/cover can be available just request increased limits on the sums insured "tick box" page. Try to have your existing insurance schedule and renewal notice available as this will give us the majority of the information that we will need. However, if you are a new business, don't worry - our business insurance team will be able to guide you through the quotation. Our single, centralised operation is located in Blackpool, Lancashire and we provide insurance services to mainland Britain. 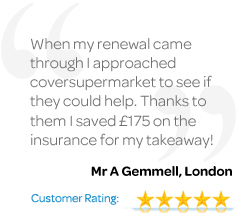 CoverSupermarket are online insurance experts who can provide a quicker, easier and more cost effective way of purchasing insurance.The direct delivery of our products makes us unique to our customers, reducing costs by providing a fully automated underwriting and quotation process.This ensures that you the customer benefits from reduced premiums whilst still enjoying the highest levels of customer service. Who do I speak to if I need to make changes to my policy? You can call our Customer Services team - Monday to Friday 9am to 5.30pm. We are here to help. Why do I need public liability? It is extremely important that you have adequate Public Liability insurance to ensure that you and your business are protected against claims of negligence by members of the general public against you or your property. Because we aim to despatch policy documents and insurance certificates the same day a confirmation of cover is issued at inception and policy documents should be with you within 3-5 working days. Yes - this will depend on how long your policy has been in force with us. However, cancellation charges will apply. Not necessarily as each case is treated on its own merits.